Great for drafters and collectors, Studio Designs' Magnifying Lamp features a 3 diopter glass magnification lens so you can enlarge and inspect your work for perfection. The flexible arm, built of steel springs and tension control knobs, extends up to 36''. 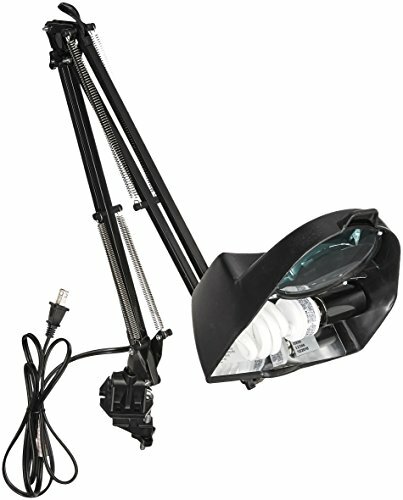 The Magnifying Lamp attaches to any Studio Designs table. 60 Watt U.L. approved for U.S. and Canada.13 Watt CFL Bulb Included. If you have any questions about this product by STUDIO DESIGNS INSPIRING CREATIVITY WWW.STUDIODESIGNS.COM, contact us by completing and submitting the form below. If you are looking for a specif part number, please include it with your message. Adesso 3218-22 Prospect LED Desk Lamp, Steel, Smart Outlet Compatible, 11"-18"